Bringing the Demogorgon to life in Stranger Things required more than interdimensional rifts to the Upside Down. The monster’s creation relied heavily on the innovative technology of 3D printing. Hit Netflix show Stranger Things has been celebrated for its both its engaging plot and its homage to science fiction pop culture from 1980s. One futuristic feature which goes as far back as the 1980s is a technology that was also a key asset behind the scenes of the show. That technology is Stereolithography (SLA) 3D printing, pioneered by Hideo Kodama in Japan and Alain Le Mehaute in France before being patented under the current name by Chuck Hull in 1984. 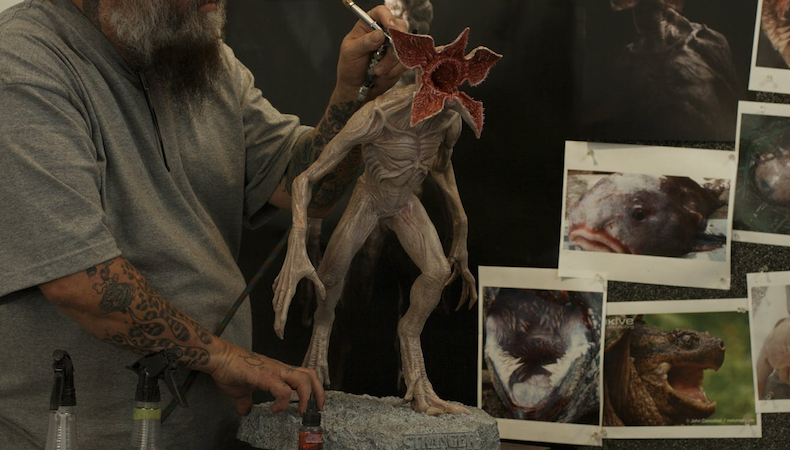 SLA was used by Aaron Sims Creative (ASC), the studio behind the visual effects of Stranger Things to create the iconic Demogorgon, the series’ hair-raising, flesh-eating humanoid monster. The Duffer Brothers, the creators of Stranger Things, asked ASC to create a practical effect for the for the Demogorgon, as they wanted to capture the authenticity of 1980s sci-fi productions. Unlike digital effects, which are computer generated and make up the vast majority of effects used in productions, practical effects are produced by hand and were used extensively in the 20th century. The creative approach that ASC settled on was a a hybrid practical and digital one. ASC president Aaron Sims was the first to sketch out the realisation of the image, from non-specific guidelines provided by Stranger Things executives. The collaboration between the ASC and Stranger Things’ executives occurred throughout the process of creating the Demogorgon. The initial sketches bore the characteristic humanoid body, flowering head and sharp teeth characteristic of the Demogorgon. After finishing and approval from the executives, ASC’s graphics team turned the design into a digital rendering. While this would usually be the end of the contemporary visual effects process. With a monster as eccentric and pivotal as the Demogorgon, however, providing a 3D copy of the end result was important. Digital 3D assets played an important role in the design process. “It seems like a lot of producers and directors want to keep that practical aspect in play. People really want to keep the physical.” said ASC VP Steffen Reichstadt. When pitching a creative idea in a meeting, prototyping and designing purely digitally means that there is no physical point of reference. While Sims himself was experienced in traditional manual modelling, with the production schedule, “we don’t have the luxury to do a sculpture here because of time”. 3D printing held the solution. Using an in-house Formlabs SLA 3D printer, smaller prints were created before larger models were then 3D printed and then manually painted. A Demogorgon model emerges from a Formlabs SLA printer. Photo via Formlabs. In industry, especially startups and small businesses, prototyping and tooling parts on demand using CAD tools and 3D printing, saves the time that would otherwise be wasted with lengthy manufacturing processes. The visual arts and film industries are now benefiting.